This article is the first part of a two-part series exploring the free 3D animation software Alice. Part 1 gets you ready to start with Alice and to explore the interface. Part 2 shares my process of creating an animation/story with Alice 3, and I hope it will inspire you too! The first version of Alice launched in 1995 as a virtual reality environment. The original developers, including Randy Pausch, chose the name Alice, based on the imaginative stories of Lewis Carroll. Alice is developed by a team at Carnegie Mellon University. There have been three versions of Alice. Currently, both Alice 2 and Alice 3 are used widely and are available in multiple languages. As you build stories, games and animations using built-in libraries, you encounter the concepts and structures of the Java object oriented programming through the drag and drop interface. The developers designed Alice 3 around mediated transfer pedagogy (Dann, Cosgove, Slater, Culbya, 2011). 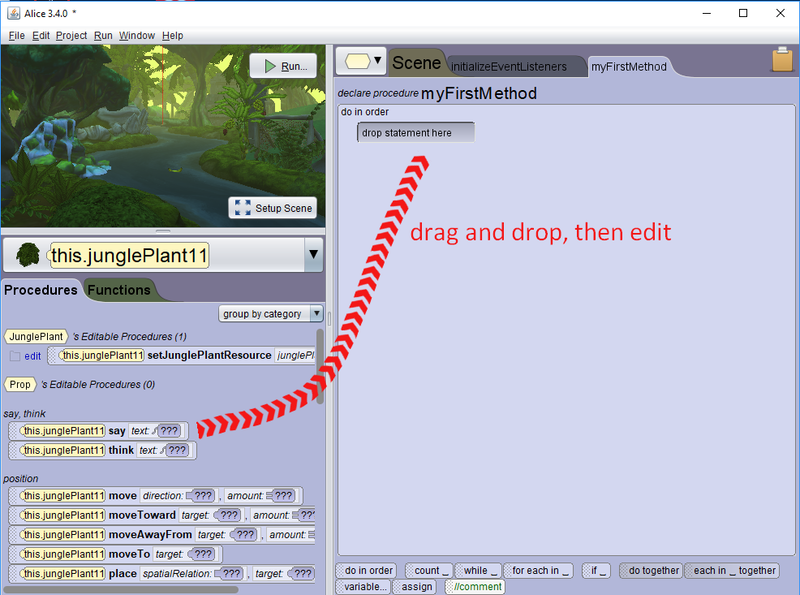 You can switch your code view between the Alice 3 drag and drop interface into Java, or display the Java code next to it. You can also export the code to NetBeans to transfer your project into a full Java environment. Even if you (or your students) have no need for learning or developing in Java, Alice 3 makes creating a world of your own imagining, attainable and incredibly fun. You can export a video of your animation to share with others. This article will focus on Alice 3, but Alice 2 is still also still very widely used by educators. Before downloading Alice for yourself, read Which Alice should I use? The best version for you might not be Alice 3. The Jaberwock! Yes, it’s Java. The sheer mention of Java, can be enough to frighten people out of the wild woods of programming. The perception of Java is that it is difficult. But please don’t run away! You will miss out on a lot of fun. I attempted and failed to learn Java. I studied a traditional Introduction to Java university-level course. I found it difficult and didn’t complete the final build project, which was to build a functioning calculator (yawn!). I found it difficult to grasp the architecture and syntax at the same time. I haven’t faced the same problem understanding PHP or Python. Java became my nemesis. At the time, not being able to master it made me feel like I wasn’t good at programming. Alice 3 has made me rethink my capabilities in understanding Java. Alice 3 not only smooths the programming learning experience, it is playful and fun! You primarily are building a world, whilst learning to think about how the elements of that world interact, in an object-oriented way. The leap into Alice 3 is not as straightforward to start coding as it is with software like Scratch 3. The key audiences for Alice 3 are upper middle school, high school, university and beyond. It can be ideal as a next step for anyone ready to explore object-oriented coding, such as those with Scratch experience. Alice bridges a gap for those not ready to tackle the deep-end of inputting syntax through typing coding. 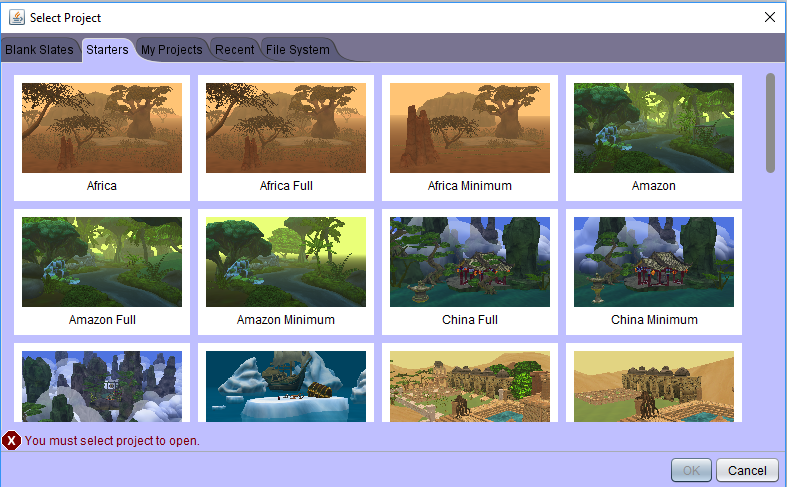 Alice 3 has a huge library of 3D models (including a Sims ™ character builder) and built-in procedures. You can also write your own custom procedures, which I’ll also explore in Part 2. Alice 3 is the newest version of Alice and there are Windows (64 and 32 bit), Mac and Linux versions. Alice, being a 3D animation software does need a bit of hardware grunt, particularly if you are frequently running a preview of your animation. See the hardware recommendations. You also might need to make sure your video drivers are up to date. For this article, I was using Alice 3 on Windows PC, Intel i7-6700 with 16GB RAM. I only encountered one Alice crash report warning after frequently running my animation multiple times. Once you are feeling happy, download and install Alice. When you first open Alice 3, it prompts you to pick a scene. I love this opening. My imagination began world-building! You can choose blank-slate worlds of ice-worlds, grassy meadows and vast oceans. Or Starters that are real-world landscapes of Africa, China or India and more, including fantasy landscapes like cloud-forests and magical forests of fungi. Feeling spoilt for choice, I began with the Amazon rainforest. If you are familiar with Scratch, you might feel comfortable to play with the drag and drop code blocks. This is what I did. I couldn’t immediately see where to add a new 3D model. So, the first thing I instinctively tried was to drag a procedure over to the right. I succeeded in making a jungle plant talk. Wow! Not very incredible, but a conversation with an ancient sentient landscape! I’m already deep in my favorite imaginary world! If you enjoy free-range exploring, you can continue bumbling around like this. 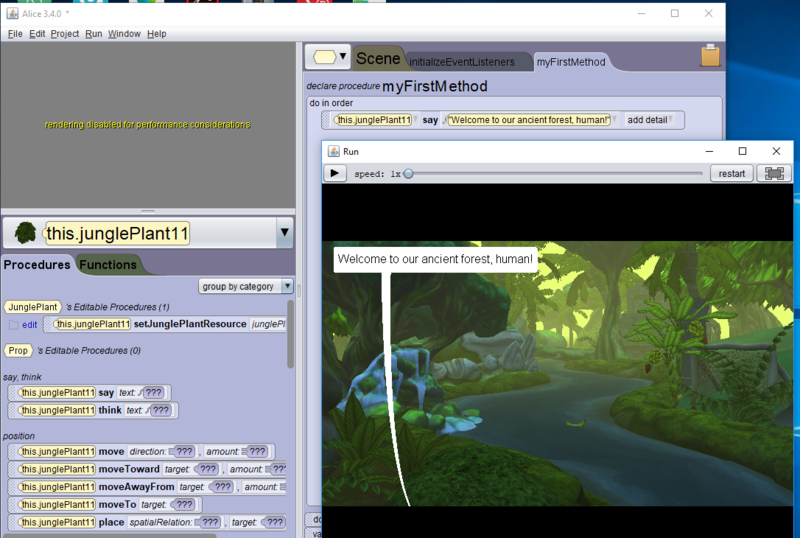 For a more logical starting point, click on the Setup Scene button in the Camera view window (top left). This takes you into the Scene Editor. 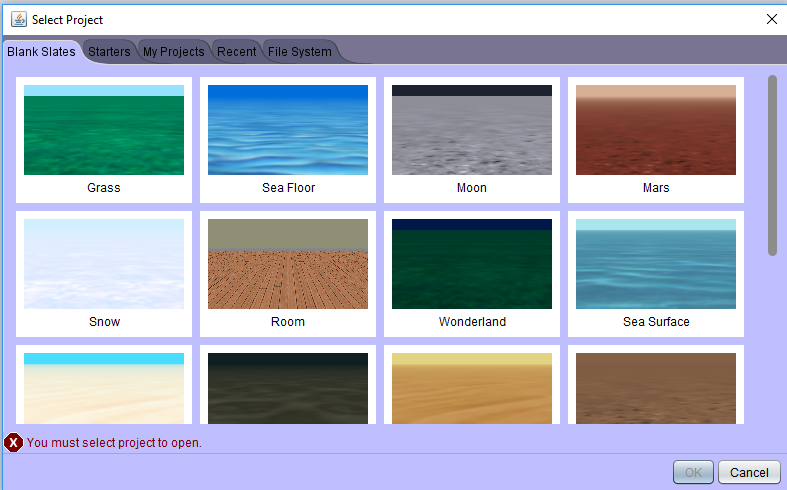 This is where you can add models from the extensive library of 3D models, and set up camera angles. View the guide to the Scene Editor to help you find your way around from here. Try some of the How to’s, Lessons, Exercices and Project in the Alice resources. Try these short Alice 3 tutorials from Duke University. See some great examples of Alice projects. Most of all, have fun experimenting! In Part 2, I share my adventures in creating a short animation in Alice 3.